The arrival of a stranger named Michael sheds new light on their circumstances. 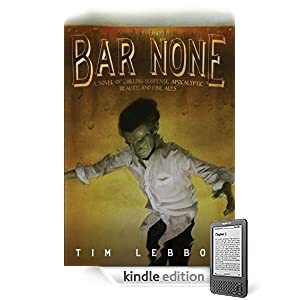 If the survivors can reach Cornwall, a few days' journey south, they will find a safe haven, called Bar None, quite possibly the last bar on earth. As they make their way across the Welsh countryside, the survivors will experience a world gone strange, where frightening beings fly high overhead, where flora and fauna press in to fill the void left by the fall of man, and, in the wreckage of civilization, where less fortunate survivors, twisted by plagues, hunger, and fear, stalk human prey. From Tim Lebbon, author of Berserk, Dusk, and Dawn comes Bar None, a novel of chilling suspense, apocalyptic beauty, and fine ales. Or purchase Bar None as a DRM-free e-book in the format of your choice through WebScription.net.